Le parc national et la réserve de parc national de Kluane sont deux sites du réseau des parcs nationaux du Canada. Ils se situent à l’extrémité sud-ouest du Yukon. Cette réserve a été inaugurée en 1972 et occupe une superficie de 22 013 kilomètres. La plus haute montagne du Canada, le Mont Logan (5 959 mètres / 19 551 pieds), de la chaîne de montagnes Saint Élie (St. Elias) est située dans le parc. Montagnes et glaciers dominent le paysage du parc, en recouvrant 82% de sa surface. Le parc abrite près de 105 espèces d’oiseaux, dont le lagopède alpin, l’aigle royal et le pygargue à tête blanche. Le système de parc binational Kluane-Wrangell-St. Elias-Glacier Bay-Tatshenshini-Alsek regroupant les parcs Kluane, Wrangell-St Elias, Glacier Bay et Tatshenshini-Alsek, a été nommé site du patrimoine mondial de l’UNESCO en 1979 pour ses paysages de champs de glace et de glaciers spectaculaires ainsi que pour l’importance de l’habitat des grizzlys, caribous et mouflons d’Amérique. Le parc national de Kluane se situe sur les territoires ancestraux des Premières Nations de Champagne et Aishihik et de la Première Nation de Kluane, qui habitent dans la région depuis très longtemps. Les ententes de chacune de ces nations avec le gouvernement canadien ont fait de leurs droits de cultiver dans la région une loi. Crédit Photo Photographie de wikibunt, contributeur de Wikipédia, utilisée en vertu d'une licence non-adaptée d'attribution de partage à l'identique 3.0 (Creative Commons Attribution-ShareAlike 3.0 Unported License). 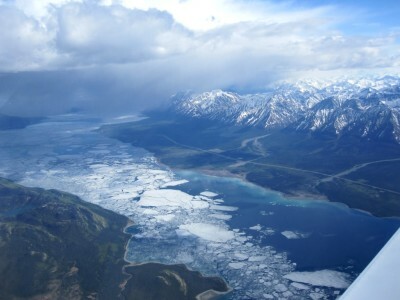 Kluane Lake. We had to delay one day because he had mechanical difficulties - we were afraid we were going to be living out the scene from Never Cry Wolf when Tyler is flown out to his camp by Rosie. However, it was all worthwhile as we got some great photos of glaciers and alpine mountains. There is no word to describe how much I loved my visit to the park, one of the most beautiful, breathtaking scenery. Kluane Lake is simply a gem, surrounded by some of the tallest and snow-capped mountains in the country. The following photo captures the beauty of Kluane National Park and Reserve, located in the Yukon Territory of Canada. In terms of travelling, I've only ever been to cities in Canada and the United States - never really anywhere that holds profound splendour to the eye. 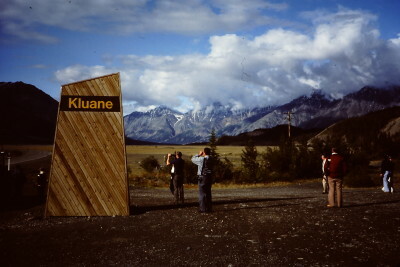 But I've always wanted to visit a place like Kluane. I think that living in Canada all my life, and having foreign parents who went through such a different childhood has made me realize all of the small things. Often living in the big city, oriented around materialistic needs, keeping focus towards media, school and education - we fail to realize all of the tiny but extremely important things that contribute to the big picture, which is the world around us. Our consumption has added to the rising epidemic of global warming, and this has affected our environment catastrophically. Living in a city really makes you realize how deeply big actions such as chemical emissions, construction and even small actions such as littering and unnecessary energy use can affect the world around you. We don't often realize that there still is beauty in parts of the world such as Kluane. By experiencing and researching Kluane, we realize that our earth is important and we need to take care of it - otherwise beauty like this will cease to exist. On a more positive note, Kluane reminds me that although sometimes the winter gets pretty tough in the city (with all of the shovelling, snow-blowing, increasing difficulty when commuting), a cold climate can be pretty stunning. It teaches me to never take things for granted - that there is always beauty in everything, even if we don't see it. The Kluane National Park and Reserve has been, and very much is, part of the traditional territory of the Southern Tutchone people, who have hunted here for time immemorial. Tachäl Dhäl, or Sheep Mountain, is named by the ST people of the region for its high amount of sheep, of which were hunted by the people. The difficult terrain of this region meant that the men and women who were hunting had to be in pretty good shape! From 1943 to 1976, the ST people were prohibited to hunt in the Park. After the hunting ban was lifted in 1976, it still took a couple more decades for the ST people to resume their traditions in the Park. The Self­Government agreements, signed between the First Nations and the Canadian Government, sustained the hunting rights in the KNPR for the Kluane First Nation (2003) and the Champagne and Aishihik First Nation peoples (1993). Like I said, the people who were hunting sheep on the steep mountains in the Park had to be in pretty good shape. While hiking here, imagine what it was like for these people to have to carry a whole sheep down the deeply slanted mountains! The ST people and the Kluane National Park and Reserve began an initiative shortly after the signing of the agreements, called: Healing Broken Connections. This was to help bring the people back into the Park to restore their historical presence. These camp activities included: sheep hunting, trapping small animals, restoring and building traditional homes, hiking throughout the park, helicopter tours and other fun activities. The camps brought together Elders, youth and community members from both First Nations, as well as, KNPR employees. The camps brought the people back into the park to share their stories, traditions and culture that were passed down from their ancestors. Keep a look out for recorded history in the Tachäl Dhäl and Haines Junction Visitor Centres! As a young, Southern Tutchone woman, I am proud to say that my ancestors have been the stewards of the land in the Kluane region for thousands of years! 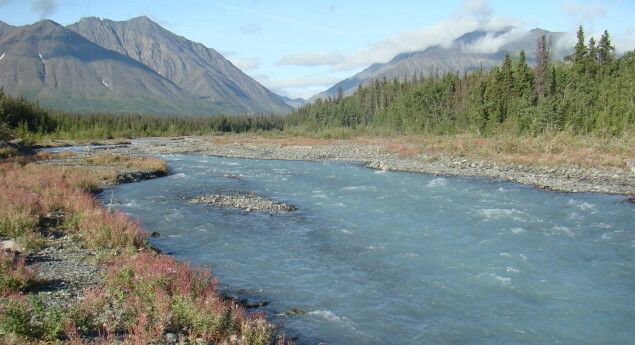 Today, stewardship of the land is shared with the Southern Tutchone people and the Kluane National Park and Reserve. 1. Visiting the KNPR usually means you will see some wildlife! Dall Sheep are the most abundant in the area and can be seen from the Tachäl Dhäl (Sheep Mountain) Visitor Centre, from a safe distance. 2. Within the KNPR, stands some of the highest mountains on the continent, including Mount Logan which is the highest mountain in Canada! So, without a doubt, you will be amongst some great scenery during your visit. 3. Dip your toes in one of the coldest lakes in the Yukon! Fed by the Kluane glaciers, Kluane Lake is the largest lake in the Yukon, and will give you a chill by its touch. 4. 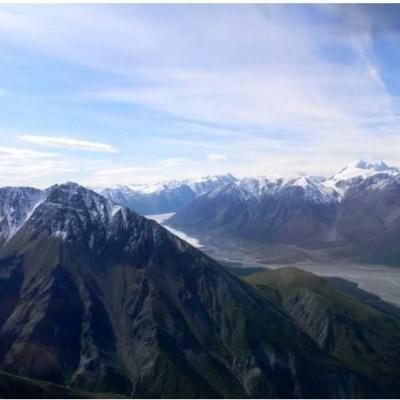 The Kluane National Park and Reserve works together with the Southern Tutchone people to include traditional names of sites within the Park, such as Tachäl Dhäl (Sheep Mountain in Southern Tutchone). 5. Visiting the KNPR, means you are visiting traditional ancient hunting grounds of the Southern Tutchone people, so keep your eyes on the look out for artifacts to report to the Visitor Centres! Montagnes et glaciers dominent le paysage du parc national de Kluane, recouvrant ___% de sa superficie. Photo: Photographie de wikibunt, contributeur de Wikipédia, utilisée en vertu d'une licence non-adaptée d'attribution de partage à l'identique 3.0 (Creative Commons Attribution-ShareAlike 3.0 Unported License).